Born 1956, mother of an adult son. Dance therapy, Gestalt therapy, clinical Hypnotherapy (according to Milton Erickson for Dr. Gunter Schmidt), trauma therapy (Dr. Lutz Besser et al. ), “Ritual Body Postures and Ecstatic Trance”® (Prof. Felicitas Goodman), “Inner Family Systems Therapy” (IFS by Richard Schwartz) et al. Counselling, psychotherapy, coaching. Supervision for psychosocial and therapeutic professions. Specialised in working with altered states of consciousness (trance), in body oriented, creative, integrative psychotherapy and in trauma therapy. Since 1990, I have been working as a research assistant and music psychotherapist at the Institute for Medical Psychology at University Hospital Hamburg (until 1992) and Heidelberg (since 1993): conducting research projects, teaching medical students, outpatient psychotherapy and counselling, cultural management, lectures, seminars, and supervision of psychosocial occupational groups. More than 100 publications on Sabine Rittner’s research projects and clinical work have been published in Germany and internationally. In numerous broadcasting and TV programs and also journalistic articles was reported on her work.To view a comprehensive list of publications, including these research projects, please see the “Publications” section. Since 1980 freelance lecturer, teaching assignments, seminar coach (see: Seminars and Further Training) at home and abroad (Europe, Japan, USA etc.). Since 1991, co-organiser of four international conventions on “Worlds of Consciousness” of the European College for the Study of Consciousness (ECBS) and management of various symposium on these topics. Long-standing close collaboration and friendship with the anthropologist and consciousness researcher Professor Felicitas Goodman. 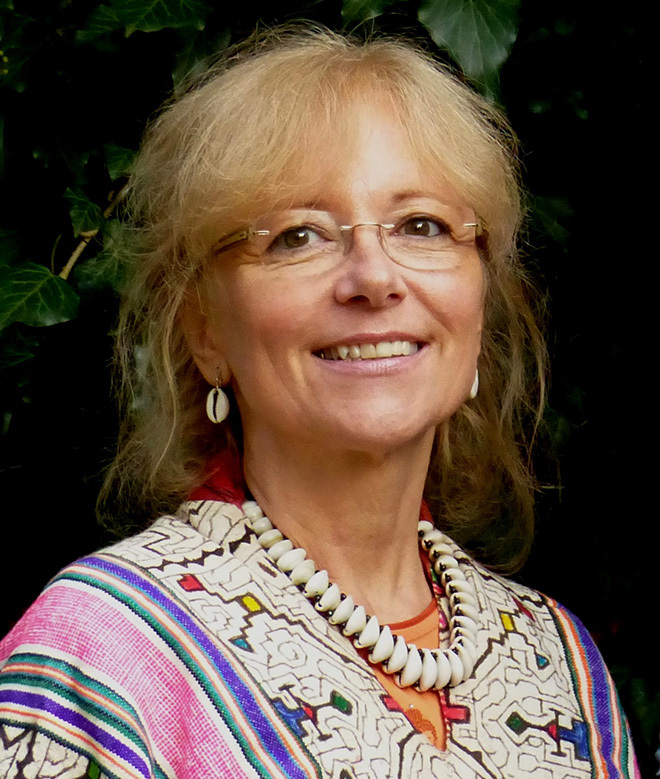 Co-founder of the Felicitas Goodman Institute in Germany and member of the training team on the teaching and research of ecstatic trance states, coach for “Ritual Body Postures and Ecstatic Trance”® (see www.Felicitas-Goodman-Institut.de). Since 1993, founded and managed the very extensive public culture and advanced training programme called “Zukunftsmusik” (music of the future) at the Institute of Medical Psychology at University Hospital Heidelberg: lectures, concerts, workshops, seminars, trainings, exhibitions, etc. Artistic work with experimental movement theatre, sound performance, as well as painting and sculptural ceramics (see www.SabineRittner-Kunst.de). For 40 years now, I have been helping people find their way back to their own SELF. With my knowledge, my experience, my intuition, and spirituality, I create safe spaces where original beauty and vitality of each human being can unfold. This leads to feedback, a revived joy of life, and new creative and transition powers. The methods I use during this process are diverse and adapted to the requirements of the moment and to everyone’s personal needs.